(1983) "Slave to the Rhythm"
"Slave to the Rhythm" is a 1985 hit song performed by Grace Jones. "Slave to the Rhythm" was the first single from Grace Jones' album of the same name, which was released in 1985. The song and the album were written by Bruce Woolley, Simon Darlow, Stephen Lipson and Trevor Horn and produced by Horn. This was Grace's first album in three years, and it contained eight variations of the same song (the single's B-side is another variation, yet to be released on CD). "Slave to the Rhythm" was originally intended for Frankie Goes to Hollywood as a follow-up to their hit debut single "Relax". The song was assembled and produced by Horn after "Two Tribes", but the project was given to Jones. Paul Morley says Horn worked on the song endlessly and had hoped it would become one of his biggest and most successful creations. The song's lyric is interpreted in various ways; as telling about slavery in Afro-American history ("Axe to wood in ancient time/Man machine, power line/Fires burn, hearts beat strong/Sing out loud the chain gang song.") or referring to the music industry and its exploitation of musicians. "Slave to the Rhythm" was released in Autumn 1985 to a great commercial success. The single became one of Jones' greatest commercial successes and is considered to be one of her signature tunes. It became one of the biggest chart successes for the singer in the UK (number 12, next to "Pull Up to the Bumper"). The track proved exceptionally popular in Belgium, New Zealand, Italy and German speaking countries, where it made it to the top 10. The original version of the single, and its remixes, also topped the American dance chart in February 1986, despite not entering the mainstream Billboard Hot 100 ranking. "Slave to the Rhythm" was proclaimed the best single of 1985 by The Face magazine. In 1994 a newly remixed version of the song reached the top 40 in the UK charts. The hit single version of the song is in fact confusingly re-titled "Ladies and Gentlemen: Miss Grace Jones" on the Slave to the Rhythm album. The track "Slave to the Rhythm" on the album is in turn an entirely different interpretation of the song—a fact which apparently eluded Universal Music when they included this version in one of their many best-of packages The Ultimate Collection. In 2012, Jones performed the song at Queen Elizabeth II's Diamond Jubilee Concert in which she hula hooped for the entire song. The music video for "Slave to the Rhythm" features the hit single version of the song, billed as "Ladies and Gentlemen: Miss Grace Jones" in the album track listing. It largely consists of previously seen footage, using excerpts from Jones' previously released music videos, "My Jamaican Guy" and "Living My Life", as well as the documentary A One Man Show. Included are also still pictures of some of the singer's most iconic looks and the Citroën CX TV advertisement. No new footage of Jones herself was filmed for the video, which features a spoken voice-over from actor Ian McShane, extracted from tracks "Jones the Rhythm" and "Operattack". The video, of which there are several versions, was directed by Jean-Paul Goude, Jones' boyfriend at the time. The video was nominated for the Best Female Video at 1986 MTV Video Music Awards, eventually losing to Whitney Houston's "How Will I Know". It was included as a bonus on the re-release of the A One Man Show video. The video starts with dialogue from Ian McShane and shows how the cover art of Slave to the Rhythm was made, a before and after of the cover art image, then it shows a series of clips from archived music videos including "My Jamaican Guy", "I've Seen That Face Before (Libertango)" & the suicide scene from "Living My Life" edited to towards the end to when Jones collapsed and dies. Shirley Bassey covered the song in her 1996 cover album, The Show Must Go On. Dutch Uncles also covered the song, altering the title "Slave to the Atypical Rhythm," releasing their cover version as a single in conjunction with Record Store Day 2013. ^ "Perfect Songs artists/writers Trevor Horn". www.perfectsongs.com. Archived from the original on 2011-11-28. Retrieved 2012-02-12. ^ Paul Morley: Liner notes for Zang Tumb Tuum: The ZTT Box Set (2008). ^ "SongMeanings Lyrics Grace Jones - Slave To The Rhythm". www.songmeanings.net. Retrieved 2012-02-12. ^ "The Face Selection: Best of '85". The Face. EMAP. 69: 40. 1986. ^ Joey Michaels. "3342. "Slave To The Rhythm" by Grace Jones". sadclownrep.com. Archived from the original on 2013-02-02. Retrieved 2012-05-23. ^ "Grace Jones - Slave To The Rhythm - Video Dailymotion". www.dailymotion.com. Archived from the original on 2012-09-04. Retrieved 2012-04-08. ^ "Grace Jones - "Slave to the rhythm"". www.mvdbase.com. Retrieved 2011-12-21. ^ "MTV Video Music Awards 1986 Highlights, Winners, Performers and Photos from the 1986 MTV Video Music Awards". www.mtv.com. Retrieved 2011-12-23. ^ "Live In NYC & London: 1981 DVD 2010 Region 1 US Import NTSC: Amazon.co.uk: Grace Jones: Film & TV". www.amazon.co.uk. Retrieved 2011-12-23. ^ "Grace Jones - Slave To The Rhythm (Vinyl) at Discogs". www.discogs.com. Retrieved 2011-12-22. ^ "Slave to the Rhythm / G.I. Blues by Grace Jones : Reviews and Ratings - Rate Your Music". rateyourmusic.com. Retrieved 2012-02-12. ^ "Grace Jones - Slave To The Rhythm (Blooded) (Vinyl) at Discogs". www.discogs.com. Retrieved 2011-12-22. ^ "Grace Jones - Slave To The Rhythm (CD) at Discogs". www.discogs.com. Retrieved 2011-12-22. ^ "Discographie Grace Jones - austriancharts.at" (in German). austriancharts.at. Retrieved 2009-11-10. ^ "Grace Jones - Slave To The Rhythm" (in Dutch). www.ultratop.be. Retrieved 2012-09-30. ^ "Item Display - RPM - Library and Archives Canada". www.collectionscanada.gc.ca. Retrieved 2011-12-21. ^ "Tous les Titres de l'Artiste choisi" (in French). www.infodisc.fr. Retrieved 2018-05-01. ^ "Chartverfolgung / JONES, GRACE / Single" (in German). www.musicline.de. Retrieved 2009-11-10. ^ "Indice per Interprete: J". www.hitparadeitalia.it (in Italian). Retrieved 2011-02-10. ^ "dutchcharts.nl - Discografie Grace Jones" (in Dutch). www.dutchcharts.nl. Retrieved 2009-10-15. ^ "charts.org.nz - Discography Grace Jones". charts.org.nz. Retrieved 2009-11-10. ^ "Grace Jones - Slave To The Rhythm - hitparade.ch". hitparade.ch (in German). Retrieved 2011-12-21. ^ "Chart Stats - Grace Jones - Slave To The Rhythm". www.chartstats.com. Retrieved 2011-12-21. 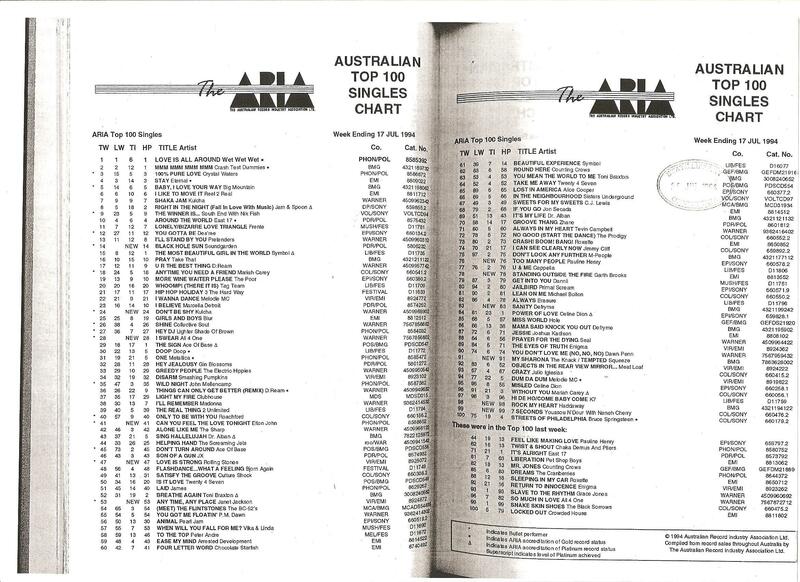 ^ "The ARIA Australian Top 100 Singles Chart – Week Ending 17 Jul 1994". ARIA. Retrieved 2016-03-09.